Although the two volumes of Logic, Language, and Meaning can be used independently of one another, together they provide a comprehensive overview of modern logic as it is used as a tool in the analysis of natural language. Both volumes provide exercises and their solutions. Volume 1, Introduction to Logic, begins with a historical overview and then offers a thorough introduction to standard propositional and first-order predicate logic. It provides both a syntactic and a semantic approach to inference and validity, and discusses their relationship. 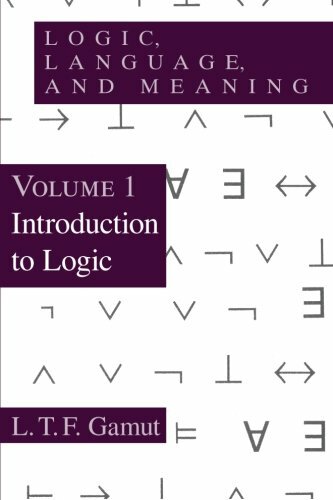 Although language and meaning receive special attention, this introduction is also accessible to those with a more general interest in logic. In addition, the volume contains a survey of such topics as definite descriptions, restricted quantification, second-order logic, and many-valued logic. The pragmatic approach to non-truthconditional and conventional implicatures are also discussed. Finally, the relation between logic and formal syntax is treated, and the notions of rewrite rule, automation, grammatical complexity, and language hierarchy are explained. If you have any questions about this product by L T F Gamut, contact us by completing and submitting the form below. If you are looking for a specif part number, please include it with your message.